Rainbow Riches? Yes, you read right! Gaming Realms proudly gives you a slingo game, themed on your favourite slot theme ever! Dreams do come true, and at Vegas Spins Casino, you get to enjoy an entertaining and fun game of slots and bingo combined on your mobile desktop or tablet! 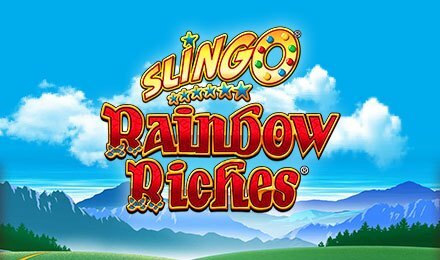 Slingo Rainbow Riches is growing more popular, as it still comes with the series of bonus rounds and features in the initial slot games. Your aim on Slingo Rainbow Riches is to form slingos, by marking off 5 numbers horizontally, vertically or diagonally. To start the game, head over to the Bet Field, where you get to set your bets to your liking. Once done, click on the Start Game button and enjoy! Amount of Paylines Selection: No paylines are available. Coin Values: Coin values range from the lowest value of 0.05p to the highest value of £200.00. Joker Symbol: These are the wild of the game, which randomly marks off a number on your grid. Super Joker Symbols: These allow you to mark off any number on the whole grid. Devil Symbol: This symbol blocks you from any potential wins. Free Spin Symbol: These add extra spins for free. Pick a toad stool and win a prize! You have three picks to win a winning value of between 1x, 5x or a fairy. Each fairy awards three extra multiplier values. If all toadstools are revealed with a remainder of 2 picks, a 3x multiplier is applied to the win. If 1 pick remains, a 2x multiplier is then added. Instead of three picks, four picks are awarded. Giving you an extra chance to boost your wins. Spin the Lucky Wheel to move from 1 to 6 places on the golden trail. When the wheel lands on “Collect”, the multiplier where you have landed is awarded. The same rules to Roach to Riches apply, but this time all prizes are doubled and you have the chance to strike gold! Three Wishing Wells will appear on the grid, where you get to pick one to pocket a big prize. 50 coins spin on the screen, with a multiplier value behind each one. Once they stop spinning, the multiplier won will appear on the screen. After this, a coin flip takes place, and will decide whether you get another one or collect your wins. Multipliers increase from 0.05x to 10x. You are presented with Gold, Silver and Bronze pots. The pots spin, then randomly come to a stop where one is chosen for you. You are then awarded with the prize inside the pot the game stopped on. Multipliers vary from 50x to 1,000x!